The name of Kawasaki is found for the first time in an old shrine record that describes the origin of Amafuri ("falling rain") Shrine in the town. This record explains that "all around, the mountains are so high and sticking out and the rivers are so steep. This place is called Kawasaki ("river and cape")". In 1878, the Japanese national government created local municipalities throughout the country and the Prefecture of Fukuoka was designated as such in 1888. In Kawasaki area, several districts united to form Amagi Village in 1887; later on, Ikejiri, Tabara, Higashi-Kawasaki and Nishi-Kawasaki came together to establish Kawasaki Village in 1889. Amagi and Kawasaki Villages united to form Kawasaki Town on April 1, 1937 and the town administration was enacted in the following year. The first Mayor of Kawasaki Town was Mr. Seijiro UEDA. He was the owner of coal mines and used to be called the "King of Coal Mines". He was once considered the richest man in Japan, ranking at the top twice, in 1951 and 1953. The residents of Kawasaki Town have always been very open-minded and welcomed all new comers when the coal mining industry flourished. This warm spirit is still very present today, and the town aims at being known as a "town where new people are invited to come". 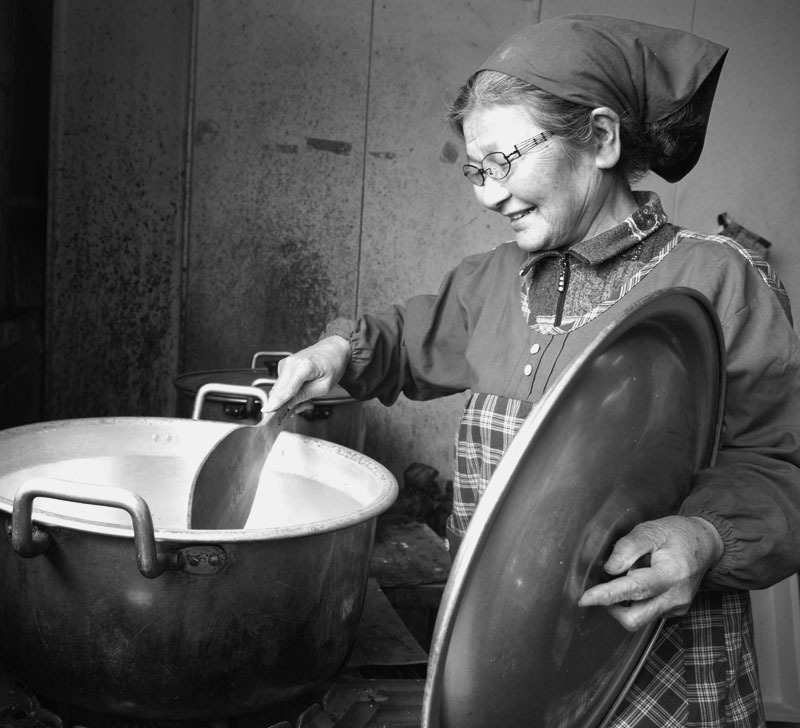 In the past, hard labor in the coal mining industry was supported by delicious local food. Today, agriculture has replaced coal mining but our delicacies are still prospering. Therefore, Kawasaki Town plans to become a town fostering an attractive collaboration between Food and Agriculture. In 1956, the UNESCO's World Peace Council recognized the famous Buddhist Zen monk SESSHU as one of the 10 Greatest Masters in the World. 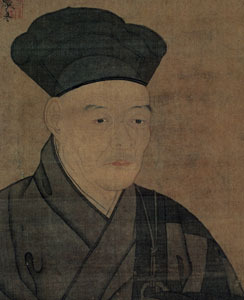 Sesshu lived during the Muromachi Era, in the 15th century, and is famous for his ink and wash paintings. He went to China (Ming dynasty) to learn ink painting skills and returned to Japan in 1469, at the age of 49. But Japan at that time was in chaos as it was deep in the throws of several civil wars, notably the Onin War in Kyoto. Sesshu decided not to return to Kyoto and came instead to Tagawa in Kyushu area. He established himself in the mountainous areas around Kawasaki and asked the Fujie Clan for their support. The Fujie Clan was a strong local power in that area and they were allied with the Taira Clan near Buzen, a border between Fukuoka and Oita. Sesshu lived in Kyushu for 7 years in total. During that time, he designed Gyoraku-en, a Japanese garden in Kawasaki, which was later designated as a National Site of Scenic Beauty by the national government. 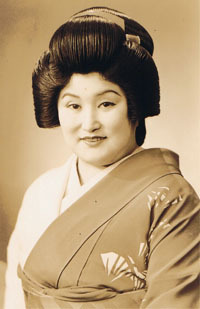 Ms. Koume AKASAKA was a popular Geisha singer and actress during the Taisho and Showa eras. She was born on April 20, 1906 in Kawasaki Town. The Hakata folk songs "Kuroda Bushi (Samurai in Kuroda Clan)" and "Tanko Bushi (Coal mining song)" that take place in Tagawa area became very popular all over Japan thanks to her performance. She was selected four times for the NHK Ko-haku Uta-gassen, an annual contest between male and female popular singers on New Year's Eve, sponsored and broadcast by the NHK, and which is considered as the most honorable song show for Japanese singers. Her nickname was "Koume Ne-san (Aunty Koume)". She died on January 17, 1992 in Kamogawa, Chiba Prefecture. 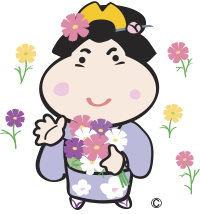 Today, Kawasaki Town's mascotte and guide is directly inspired by Ms. Akasaka. You can see and find "Koume-chan" all around town. Click here for listening to three famous songs by Ms. Akasaka: "Otemoyan", "Shô Hakata Bushi" and "Kuroda Bushi"
must-see locations when you visit us ! This exceptional garden offers different views and scenes for all four seasons. 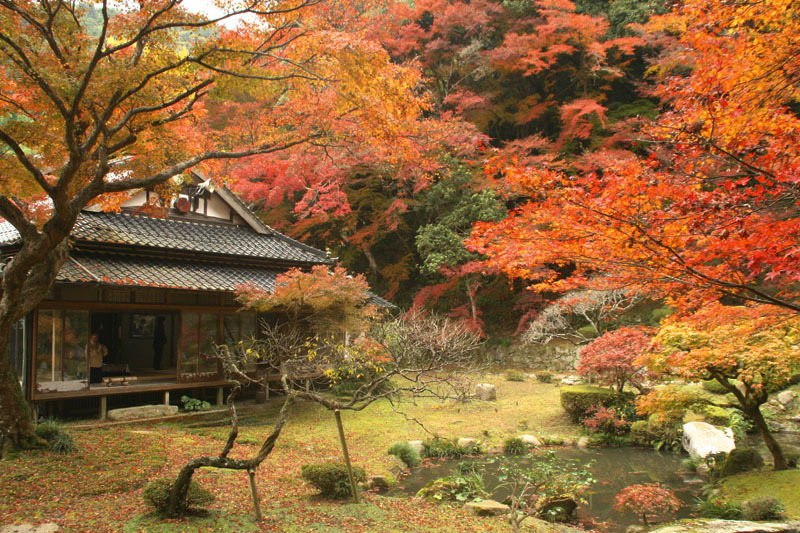 Gyoraku-en garden is designated as a National Site of Scenic Beauty. 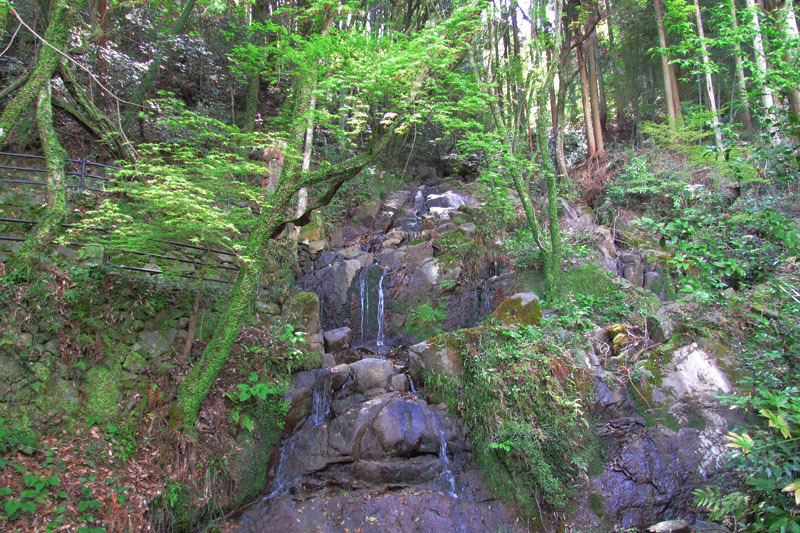 Gyoraku-en was designed by the famous Buddhist monk Sesshu in the 15th century. He was also known as the master of ink-wash paintings. Gyoraku-en literally means ”fish enjoying a garden”. The name came originally from a old Chinese poem: “If fish can enjoy, people can enjoy, too; if people can enjoy, fish can enjoy, too.” When this garden was designed, Japan was in chaos with many wars tearing it apart. Sesshu felt so much regret about this that he designed many Shangri-La gardens, hoping for peace. 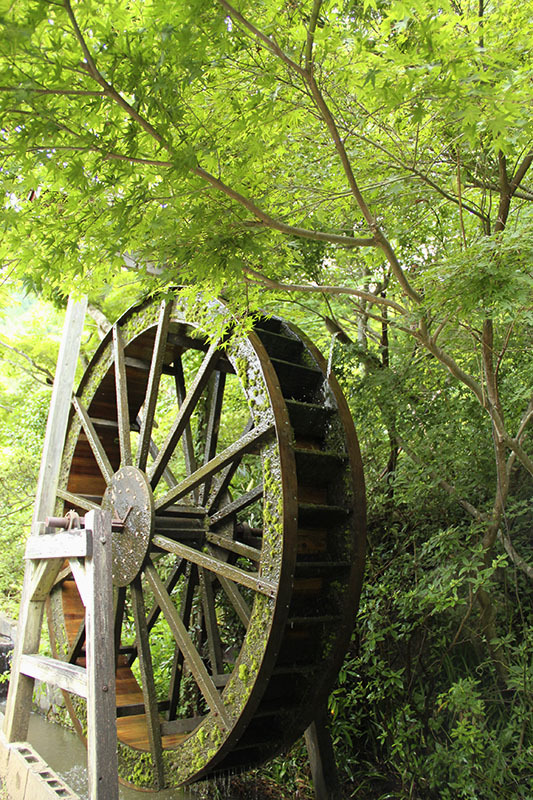 Kawasaki Town is located in a basin valley surrounded by steep mountains and is blessed by a beautiful natural scenery, with rivers flowing with clear and fresh water. 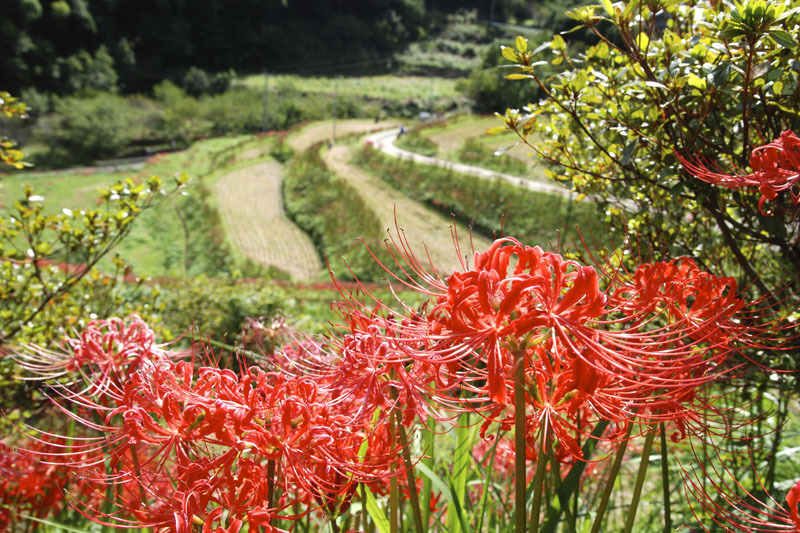 Visitors can enjoy the beauty of sun flowers in Nahiko Field, or Higan-bana (cluster amalilys) in Ataka area. 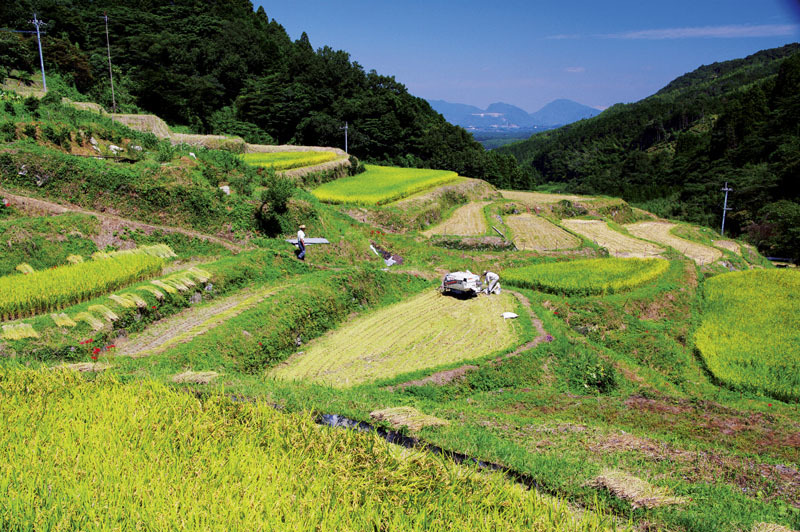 Due to the mountainous ground, rice fields have been built in terraces, offering an harmonious and peaceful sight with many shades of green and blue. Kawasaki Town is proud of its fresh and delicious local products. The town is blessed to have more insects and animals living in its soil compared to other Chikuho areas. Thanks to this, the town's farmers are able to use less pesticides in their farming process. In addition, harvest comes a little later than for other towns and villages nearby because of its mild climate and geographical features. Kawasaki Town can sell its local products after harvest is over in other areas. 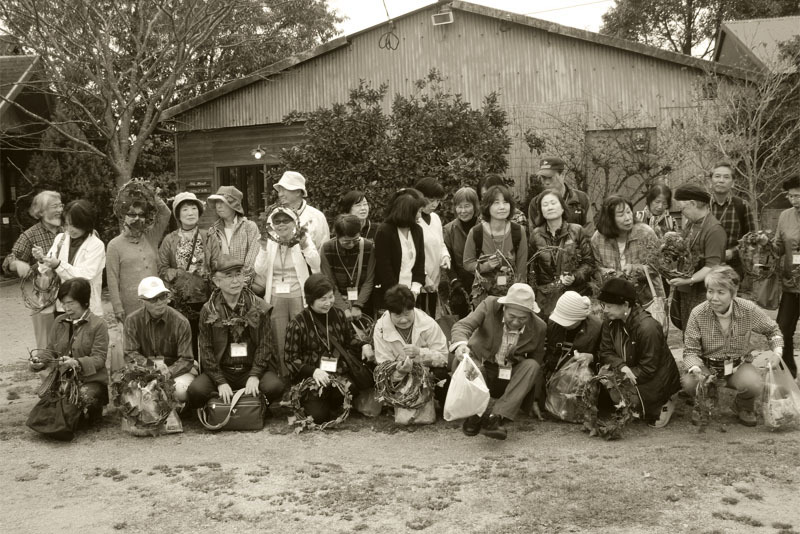 Kawasaki Town can therefore provide vegetables and fruits after the main harvest period, and they are considered as rare products for that time of the year. Kawasaki is located in a basin where temperature differences are significant (within the same day and between each season). As a result, root vegetables such as taro and Daikon radish are very tasty. Because the town is surrounded by mountainous areas, all nutrients are accumulated and absorbed in the soil. 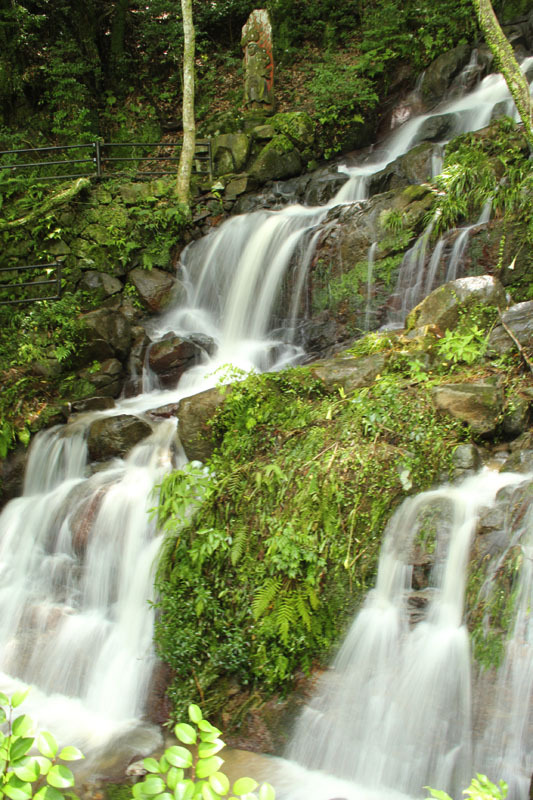 Water from free-flowing rivers also contributes to the growth of rice and vegetable farming. In a part of Ataka area, Aigamo-nouhou (rice growing using ducks) is carried out by some farmers. They sell it as organically grown rice with reduced amounts of pesticides. Food is an important part of local traditions and contributes to promoting the town and attracting visitors. In the last years, KAWASAKI PAN-PAKU (Bread Fair) has become very popular. 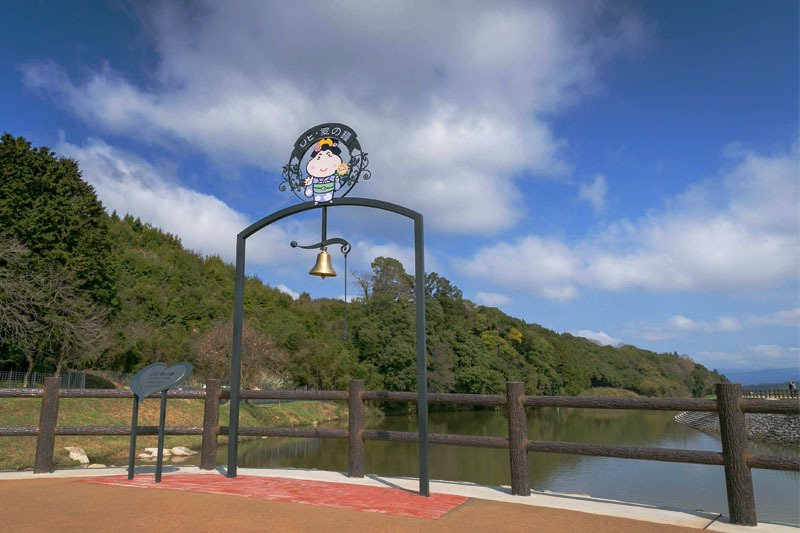 In a close collaboration with Laputa Farm and Kitchen TAKASE (a local French restaurant specialized in gibier), the town has been organizing food spots and sightseeing spots during the past years. 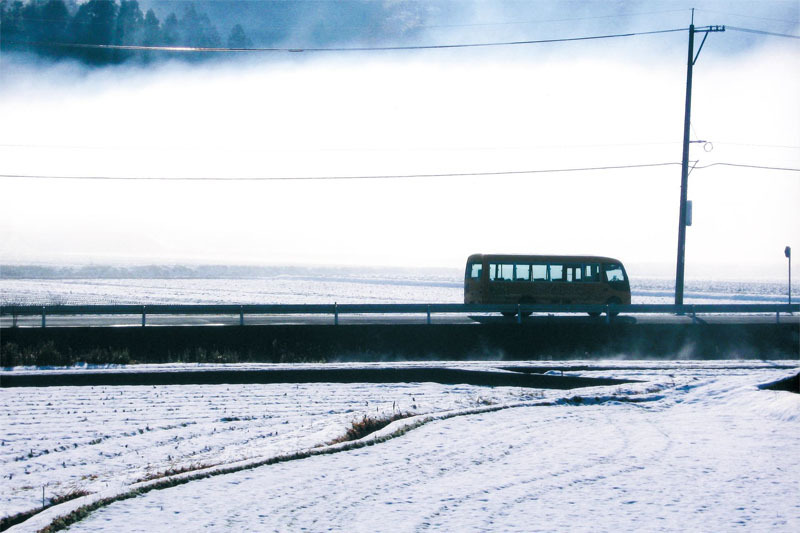 These bus tours are organized and guided by Mr. Yamamoto, the Manager of Kawasaki Tourist Association. Visitors can buy all local vegetables and fruits at the town's farmer's market De-ai. As for fruit picking, Laputa Farm provides pear or grape picking experience in summer time. Farmers of Kawasaki Town also produce and collect natural honey called Kokusan Tennen Hachimitsu, based on various types of flowers and plants as well as astragalus. 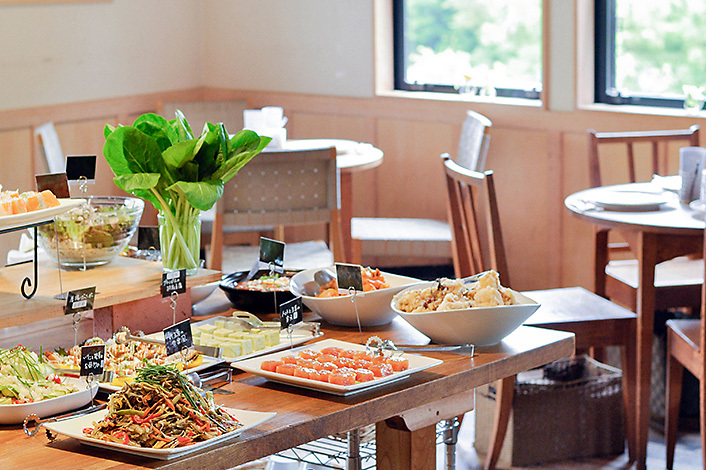 Laputa Farm restaurant offers more than 60 delicious dishes made with over 40 fresh vegetables and fruits, most of them locally grown. All of their products available at their shop, such as bread, sweets and jams are homemade and can also be bought for being enjoyed at home. Outside the main restaurant, a lively cottage offers a friendly open space for events or BBQ. Kawasaki Town is located just half way between Fukuoka City and Kitakyushu City. 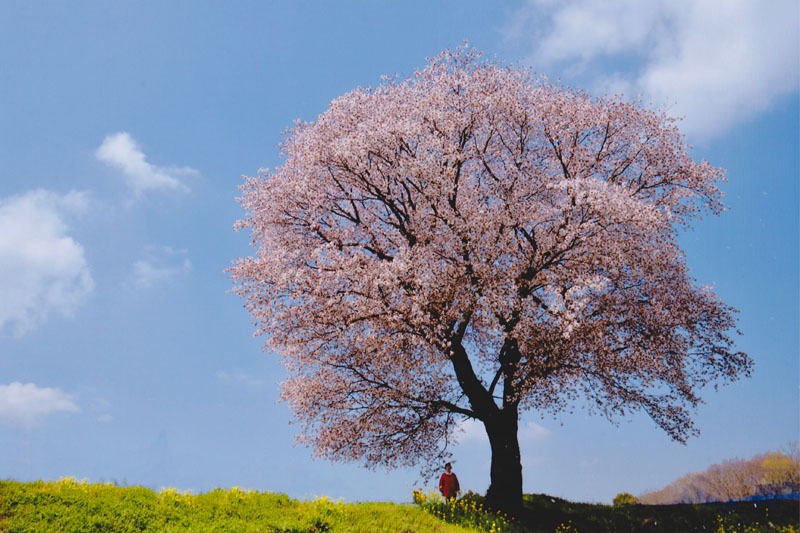 It belongs to Chikuho area, in Fukuoka Prefecture. Total area covers 36.1 square kilometers, 4.9 km from East to West, 12.6 km from North to South. 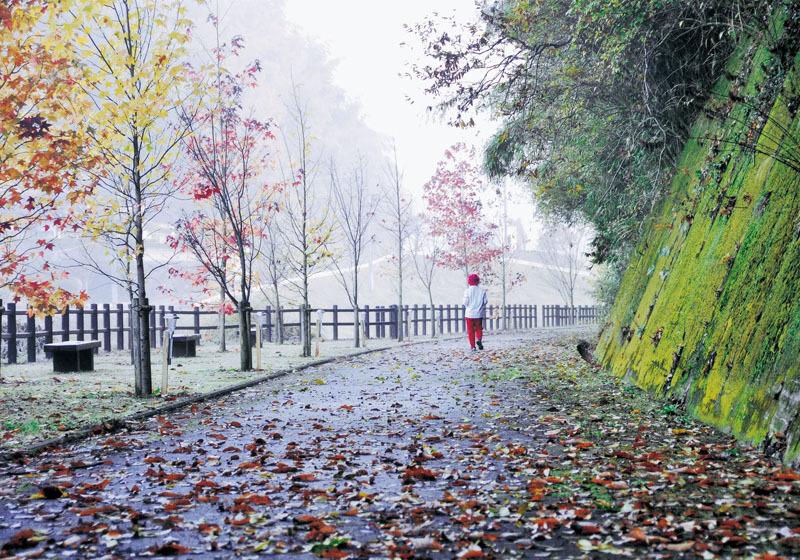 Its climate is typical of northern Kyushu area and very mild. Average temperature is 15.6°C. Rain fall is 1,543 mm. As of today, it has experienced very few flooding or big natural disasters. Get in touch with us ! For any question or inquiry, make it simple, and drop us a line, we would be more than happy to help and answer you. Or, you can just say hello, and come have a coffee in our beautiful region.